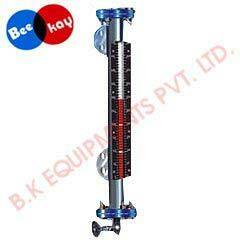 We stand as the most prominent Magnetic Float Level Indicators Manufacturers and Suppliers, based in India. Our Magnetic Level Indicators are manufactured using magnetic float that makes it perfect for the hazardous fluids. High quality double color magnetic capsules are used as an indicator. Our Magnetic Level Indicators are extensively used in oil systems, hazardous pressurized vessels, tanks and other process vessels.